Prison guards stand outside MP Duminda Silva’s hospital room after he was remanded as a prime suspect in the killing of former parliamentarian and Presidential Advisor, Bharatha Lakshman Premachandra. Five uniformed officers, two armed with rifles stood outside the room while about 13 supporters, men and women stood on aside with no permission to enter. Presidents Counselor, Hemantha Warnakulasuriya appearing for the MP said noone is permitted to visit Mr. Silva as doctors have advised to keep the environment germ free as there was the risk of his condition getting worse. “Even if he is out on bail we are not in a position to take him out of the hospital until the doctors recommend it. 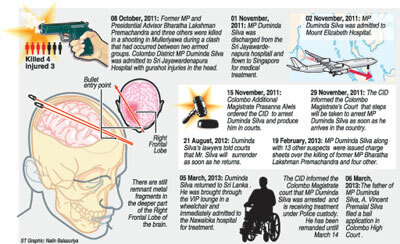 There were three bullets which entered his brain during the shootout but they weren’t able to remove one bullet,” he said.Parliamentarian Silva was taken into police custody after he returned from Singapore on March 5. 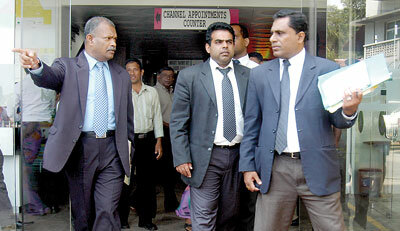 Colombo Additional Magistrate, Sandun Vitarane was also present in hospital. The UPFA member arrived at the Bandaranayake International Airport from Singapore on Tuesday. 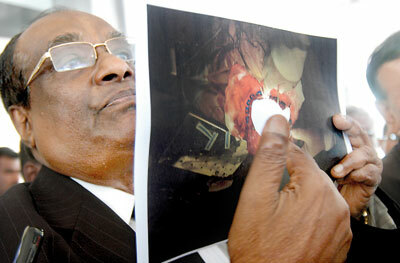 He was under medical treatment at Mount Elizabeth Hospital, Singapore.